As an IT geek, Dilbert has been my favourite cartoon for a long long time. It was the only cartoon that came close to reflecting my experience of the world as a cube rat. However, Dilbert's place has been usurped (sorry Scott Adams) by Randall Munroe at www.xkcd.com. Randall is brilliant (he built robots at NASA so its not really hyperbole to say that) techically and comically as well. His creations are a fresh take on all things geeky and I'm becoming a big fan. 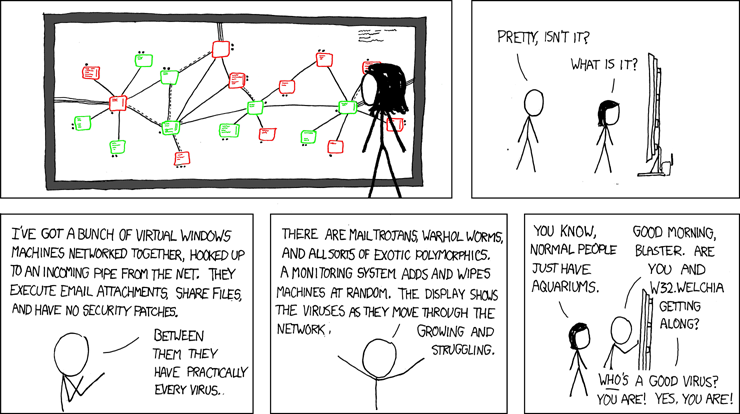 I predict Randall Munroe will be the next millionaire cartoonist a la Scott Adams. The tshirts have started. The books will follow soon.